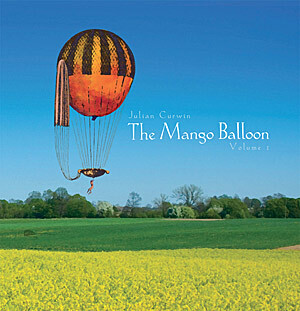 GUITARIST Julian Curwin borrows six members of The Tango Saloon to float liltingly aloft on this whimsical flight through tango, gypsy swing and spaghetti western to klezmer, helped by Eddie Bronson on clarinets. In 13 Curwin originals the mood is light and airy, yet varied. Sam Golding adds melodrama on tuba and some delightful upper-register bends on trumpet. Curwin’s strings ripple, twang and indulge in a little wah-wah. Marcello Maio’s accordion buzzes and undulates; his piano is simple and delicate. With Mark Harris (double bass), Danny Heifetz (drums) and Jess Ciampa (percussion), the Balloon breezes along on a carefully crafted, carefree adventure to any Shangri-La we fancy. CD launch: May 10, Bar 303, Northcote. This entry was posted in CD REVIEWS and tagged Bar 303, CD review, CD reviews, Danny Heifetz, Eddie Bronson, Jezz Ciampa, Julian Curwin, klezmer, Marcello Maio, Mark Harris, Sam Golding, The Evelyn Hotel, The Mango Balloon, The Tango Saloon, The Toff in Town. Bookmark the permalink.